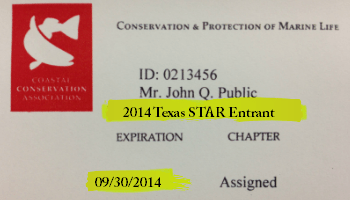 Your Membership Card should show “2014 Texas STAR Entrant” in order for you to be eligible to fish the STAR Tournament. If your membership in CCA expires during the tournament, your STAR Tournament entry will become invalid! You do not have to have your card to fish, weigh-in or win, but please be aware of your current membership & entry status! PARTICIPATION: 1. Only members in good standing of the Coastal Conservation Association Texas (CCA TX), the Coastal Conservation Association, or its youth organization, New Tide, who are registered for the Tournament are eligible and licensed to participate. A New Tide member must be at least 6 years old in 2014 in order to be eligible to enter the STAR tournament. Entry fee is FREE however the New Tide member must be registered for the current year STAR tournament, regardless of membership expiration date, to be eligible and licensed to participate. CCA TX assumes no responsibility for registration availability at any retail outlet, nor is any retail outlet authorized to back-time or back-date any STAR registration, or weigh-in form. No top prize winners (except for special drawing prize winners) or member of their immediate family (father, mother, spouse, children under 18, or relative living in the same household) are eligible for entry into the tournament for three years after winning a top prize, or six years if participant has won once before. 2. Participants and fish must comply with State of Texas Rules and Regulations and agree to be bound by the terms of these STAR Tournament Rules, Release and Indemnity Agreement. 3. Persons who presently or during the three (3) years prior to the beginning of the Tournament have acted as fishing guides, commercial fisherman, commercial finfisherman, bay shrimpers, bait shrimpers, gulf shrimpers, bait shrimp dealers as those terms are defined by Chapters 47 and 77 of the Parks and Wildlife code, or who have held licenses issued pursuant to those chapters or pursuant to any federal law are not eligible. The nominal sharing of expenses by participants is not considered operating a boat for compensation. 4. No salaried employee of the Coastal Conservation Association Texas or Coastal Conservation Association shall be eligible to enter the competition for a prize. Any person who has failed to pass the required polygraph examination, or any person who has at any time committed an offense defined in Chapter 66, Section 66.023, Parks and Wildlife Code entitled, “Fraud in Fishing Tournaments” is BANNED from participating in the remainder of the tournament and any future STAR tournaments. DATES/TIME: 5. The Tournament will begin at sunrise on Saturday, May 24th, 2014 and end at 5:00 p.m. on Monday, September 1st, 2014. Only fish caught during this period will be eligible. ENTERING FISH: 8. Fish eligible to be entered into the Tournament are tagged Redfish, Speckled Trout, Flounder, Sheepshead, Gafftop, King Mackerel, Dolphin (Dorado) and Ling (Cobia). Minimum entry lengths: Flounder must be a minimum of 18”. Minimum entry weights: Speckled Trout must meet an eight pound minimum for entry in the Lower, Middle, and Upper Coast, 30 pounds for King Mackerel, 20 pounds for Dolphin (Dorado), 50 pounds for Ling (Cobia) and Texas legal sizes for other fish. All winning fish (except tagged red drum) shall be determined by weight. In the event of a tie, the fish that was weighed in first shall be declared the winner. If weigh-in times are identical, the person who registered for the Tournament first shall be declared the winner. 9. All fish entered into competition must have been caught by the Participant and must be weighed, or in the case of tagged red drum, presented at a designated Official CCA TX Weigh-in Station. No fish will be weighed without signing the official weigh-in registration form. 10. No transfer of fish among Tournament participants shall be allowed. 11. Fish must be weighed in within 24 hours of being caught. No fish may be weighed in after 5:00 p.m. on September 1, 2014. 12. No frozen, spoiled, gutted, altered, or mutilated fish will be eligible for entry, except tagged red drum may be gutted. REDFISH DIVISION RULES: 13. Sixty tagged redfish will be released into the coastal waters. The tags placed on the redfish will read “2014 CCA TX/STAR (Tag Nos. TA551 – TA650)”. Only the first ten redfish entered, having the tag described above, will receive a prize. To be eligible, each tagged redfish, with the tag still identifiable, intact and completely attached to the fish, must be entered into the Tournament at a designated CCA TX official Weigh-In Station, and with the date and time of entry clearly marked on the official weigh-in form. Each person shall be eligible to win only one prize for a tagged redfish. If a participant under 16 years of age, on the day of the Awards Ceremony, is a first through fifth winner in the Redfish Division, a college scholarship and boat prize package will be awarded in lieu of the truck/boat prize package. All tagged Redfish become the property of CCA Texas. SPECKLED TROUT DIVISION RULES: 14. For Speckled Trout, the Texas Coast will be divided into three areas, each having its own top prize fish. The three areas are as follows: Lower Coast: from the Texas/Mexican border to the south side of Padre Island Drive (Highway 358) and along the south side of the John F. Kennedy Causeway (Park Road P22) to and including the Bob Hall Pier; Middle Coast: from the north sides of Padre Island Drive, the John F. Kennedy Causeway and the Bob Hall Pier to the easternmost (a line drawn seaward 140 degrees true) bank of the San Bernard River; and Upper Coast: from the easternmost bank of the San Bernard River to the Texas/Louisiana border, including the common boundary waters of Texas/Louisiana as defined by TPWD and the extension of the Texas border seaward 200 miles. 15. All speckled trout entered become the property of CCA Texas. 16. Speckled trout must be caught in the bay system in which they are submitted for entry into the Tournament. The division (Upper Coast, Middle Coast, Lower Coast) in which the Trout is to be entered must be declared by the participant at the time of weighing in and indicated on Weigh-In form. To assure this requirement, the Texas Parks & Wildlife Department is authorized to perform scientific tests to verify location of catch. STARKIDS SCHOLARSHIP DIVISION RULES: 17. All RULES, RELEASE AND INDEMNITY agreements of the STAR Tournament apply to this division. 18. To be eligible to fish in this division, kids must be at least six (6) years old during 2014 and must be no more than ten (10) years old on the day before their catch. 19. Fish eligible to be entered into this division are Flounder (minimum length requirement of 18 inches), Sheepshead and Gafftop. The largest fish in each of these three (3) species offers the winning child a $50,000 scholarship at an accredited college or university. 20. The winning participant’s parent and/or guardian must agree to sign a scholarship contract that includes default provisions based on performance. The intent of this award is to provide an education at an accredited college or university based on minimum requirements for full-time students as supplied by the chosen school. 21. Each child who submits a fish for entry must have a parent/guardian and/or adult sponsor who can verify this specific catch. At weigh-in, the parent/guardian and/or adult sponsor must sign and agree to abide by all STAR Tournament Rules, including polygraph testing. STARTEENS SCHOLARSHIP TROUT AND INSHORE DIVISIONS RULES: 22. All RULES, RELEASE AND INDEMNITY agreements of the STAR Tournament apply to these divisions. 23. To be eligible for these divisions, youths must be at least eleven (11) years old and no more than seventeen (17) years old on the day the youth registered for the tournament. A youth who was seventeen (17) years old on the date of registration is deemed to be eligible throughout the tournament. 24. Fish eligible to be entered in this division are Speckled Trout (minimum weight requirement of 6 pounds), Flounder (minimum length requirement of 18 inches), Sheepshead and Gafftop. The largest trout in each of the areas: Lower Coast, Middle Coast, Upper Coast (as described in Rule 15) and statewide the largest Flounder, Sheepshead, and Gafftop offers the winning youth a $20,000 scholarship at an accredited college or university. 25. The winning participant’s parent and/or guardian must agree to sign a scholarship contract that includes default provisions based on performance. The intent of this award is to provide an education at an accredited college or university based on minimum requirements for full-time students as supplied by the chosen school. Rule 21 is also applicable. OTHER RULES: 26. If a participant under 18 years of age wins a prize, their legal guardian over 18 years of age will receive the prize in their behalf. 27. Any person, including minors and their parent/sponsor, entering a prize-winning fish, must agree to the taking of a polygraph test, if required, and each person entering the Tournament agrees to submit to a polygraph. Polygraph tests are to be taken at the time requested by the STAR Tournament Committee. Failure to take and/or to pass the polygraph SHALL result in disqualification. All travel expenses are to be paid by entrant. 28. Any protest must be submitted, in writing, to the CCA TX/STAR Tournament Director at 6919 Portwest Drive, Suite 100, Houston, TX 77024 by 5:00 p.m. on September 8, 2014. 29. The decision of the CCA TX, the Tournament Director, and the CCA Tournament Rules Committee, in their sole discretion, shall be final on any matter. 30. Top prize-winners are responsible for payment of any applicable taxes. PRIZES: 31. Participants shall be eligible to win only one prize or scholarship in this Tournament. Any youth or child can win only one scholarship in this Tournament during their lifetime. If a person catches and enters the heaviest fish in more than one division, they must elect the division for which they wish to claim top prize. If a person catches and enters a tagged redfish (see Redfish Rules), the Participant is not eligible to win any other prize in the Tournament. Only top prize-winners will be required to attend the STAR Awards Ceremony on/or around Oct. 2, 2014 to take receipt of their prize. Runner-up prizes will not be presented at awards ceremony, but will be shipped to winner or picked up at the CCA office. RELEASE, HOLD HARMLESS AND INDEMNITY: 32. IN CONSIDERATION OF BEING ALLOWED TO ENTER THE STAR TOURNAMENT, EACH PERSON AGREES AND CONTRACTS TO RELEASE, INDEMNIFY AND HOLD HARMLESS THE COASTAL CONSERVATION ASSOCIATION OF TEXAS, ITS OFFICERS, DIRECTORS, EMPLOYEES, REPRESENTATIVES, THE TOURNAMENT DIRECTOR AND ALL COMMITTEE PERSONS, THE TOURNAMENT SPONSORS AND WEIGH-IN STATION OWNERS AND THEIR RESPECTIVE OFFICERS, DIRECTORS, EMPLOYEES AND REPRESENTATIVES FROM ANY AND ALL LIABILITY, CLAIMS OR DAMAGES ARISING OUT OF OR IN ANY MANNER WHATSOEVER CONNECTED WITH THE TOURNAMENT INCLUDING ITS PLANNING, OPERATION OR CONDUCT AND INCLUDING BUT NOT LIMITED TO CLAIMS FOR PERSONAL INJURY, WRONGFUL DEATH, SURVIVAL DAMAGES, ECONOMIC LOSS, PROPERTY DAMAGES OR CLAIMS RELATING IN ANY WAY TO THE AWARDING OF PRIZES IN THE TOURNAMENT. IT IS THE EXPRESS INTENTION OF THIS AGREEMENT THAT EACH ENTRANT IS INDEMNIFYING EACH OF THE FOREGOING RELEASED AND INDEMNIFIED PARTIES FROM THE CONSEQUENCES OF THEIR OWN NEGLIGENT CONDUCT, WHETHER SOLE NEGLIGENCE OR CONTRIBUTING NEGLIGENCE, GROSS NEGLIGENCE, OUTRAGEOUS MISCONDUCT, STRICT LIABILITY, COMMISSION OF TORT, BREACH OF CONTRACT, AND BREACH OF WARRANTY. THE PARENT OR GUARDIAN OF ANY MINOR ENTERING IN, REGISTERING FOR OR FISHING IN THE TOURNAMENT DOES FURTHER CONTRACT AND AGREE THAT THIS RELEASE AND HOLD HARMLESS AGREEMENT SHALL BE BINDING UPON ANY MINOR ENTERING THE TOURNAMENT. WINNER WILL BE REQUIRED TO EXECUTE AN ADDITIONAL RELEASE, INDEMNITY AND HOLD HARMLESS UPON RECEIPT OF PRIZE. 33. ANY CONTROVERSY OR CLAIM ARISING OUT OF OR RELATING TO THE TOURNAMENT SHALL BE SETTLED BY BINDING ARBITRATION CONDUCTED IN HOUSTON, HARRIS COUNTY, TX, IN ACCORDANCE WITH THE COMMERCIAL ARBITRATION RULES OF THE AMERICAN ARBITRATION ASSOCIATON AND JUDGMENT UPON THE AWARD RENDERED MAY BE ENTERED IN ANY COURT HAVING JURISDICTION THEREOF. 34. SHOULD LITIGATION OR ARBITRATION RESULT BETWEEN A PARTICIPANT AND CCA TX, IT IS AGREED THAT THE PREVAILING PARTY IN SUCH LITIGATION OR ARBITRATION SHALL BE ENTITLED TO RECOVER REASONABLE ATTORNEY FEES AND COSTS.